The Great Himalayan National Park Conservation Area is an undisturbed habitat in the ecologically distinct Western Himalayas. 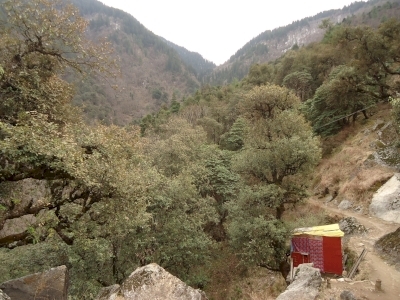 It holds diverse flora with greatest concentration of medicinal plants known for all of the Himalayas. It is the habitat of 4 globally threatened mammals such as Snow Leopard and Himalayan Brown Bear, and 3 globally threatened birds including the Western Tragopan pheasant. The park lies in the Himalayan mountains in the state of Himachal Pradesh. The site covers Great Himalayan National Park plus the Tirthan and Sainj Wildlife Sanctuaries. Site visited recently - March, 2019. As always in similar cases it is not easy to distinguish actual boundaries of Great Himalayan National Park (GHNP). 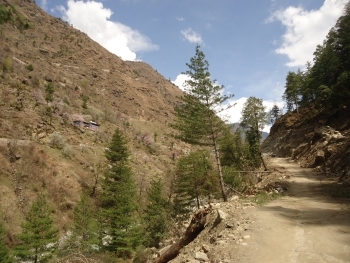 On a road Aut - Banjaar, especially after passing Tirthan river I saw many posts suggesting that you are on the premisses of GHNP, but following the official map I think that park in this part starts only from Sairopa village located on Banjaar - Gushaini road. Reaching that place you are already in so called eco zone, but to reach core zone of GHNP you should go to Gushainin and take a 4-5 km trek from there (1,5 hours, one way). At the beginning it a local road - take the one on the right side of the river, later on it is just a path (I didn't saw it on my mobile map, it is not also correctly shown on google maps). To reach the core zone of GHNP you should pass through 3 different hamlets (have in mind that it is easy to loose the correct way there as there are local paths to particular buildings). Boundary of GHNP is accessible after one hour hike, the first sign of national park is further kilometer ahead (Darakhali Point). Unfortunately I did not have much time to have a bigger trek through mountains. There are agencies organising multi-day treks within GHNP. It can be done on the spot in villages (Banjaar, Saitropa, Gushaini). Any of the place can also serve as a base for exploring the area. Some practicalities as of March 2019. The best point to begin journey is either Kullu or Bhuntar (where Kullu airport is located). From any of these towns it is possible to go by bus to Aut where it is possible to change a bus for one going to Banjaar. Price for Kullu - Aut around 40-50 Rs, the same for Aut - Banjaar part. Banjaar - Gushaini - there are buses but not very frequent. Instead you can take local taxi (they charge 300 Rs - one way or 1500 Rs for full day - including waiting time). Accommodation in the area - very frequent, although the majority are of Indian standard. Average prices in hotels are a bit higher than in the rest of India - 700 - 1400 Rs per double. Restaurants are also very common.